Anyway, this appears to be a chop, pour and drop situation that allows your crock pot to do most of the work for you. And with the extensive film of dreary that is covering Tennessee this week, it’s the perfect solution to your mood-funk. In short, I would like to put this in my belly and my belly in my fuzzy pants and my fuzzy pants in my bed. So I want to eat soup in bed. So really no different from any other day. Happy Friday! Trim roast and cut into 2-inch pieces. Stir together all ingredients in a 6-quart slow cooker. Cover and cook on low 10 to 12 hours or until potatoes are fork-tender. Remove pork with a slotted spoon, and shred. Return shredded pork to slow cooker, and stir well. Ladle stew into bowls and enjoy. It’s that time again, Memphis. The time when the weather is warm but not yet a sweaty swamp, the work days seem a little bit shorter with a patio to look forward to at the end of the day, and the beer and BBQ flow freely from the banks of the Mississippi. 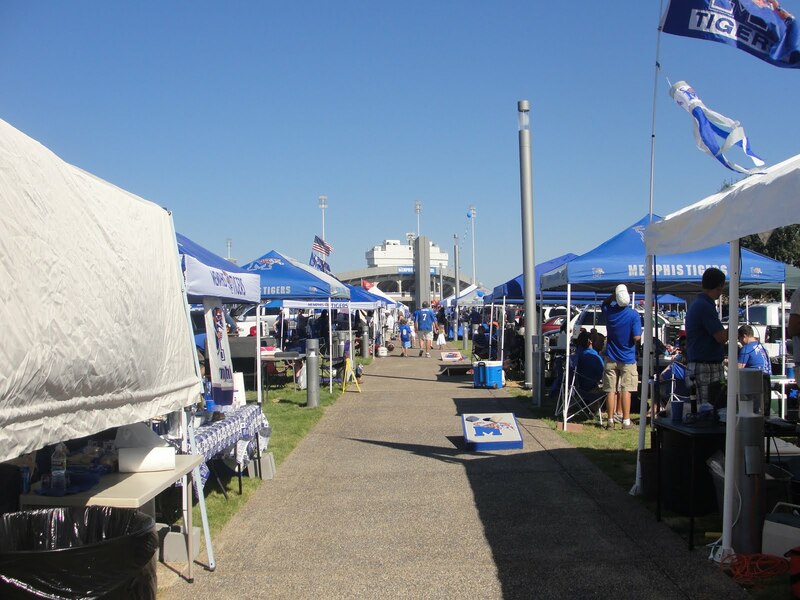 Well actually, as most of you know, the Mississippi is giving the proverbial wet finger to all of us this year, so the beer and BBQ will have to flow from the banks of Central Avenue at good ole Tiger Lane. While the riverside breeze will undoubtedly be missed, Memphians know BBQ Fest is about the people, and you can always count on this crowd for a good time. In honor of BBQ Fest week, we at Nummy would like to bring you an offering from the kitchen of JR Grosshans. I have yet to taste this succulent selection, but The Chef assures that JR knows how to do a pig right. And I believe him. JR is too good a Southern boy to do pork wrong. Make the rub: Mix all ingredients. Set aside 1.5 tbsp vinegar for the sauce. Sprinkle the remaining rub all over the pork. Set up grill for indirect heat and preheat to medium low. Place a large drip pan in the center and toss 1 cup of wood chips on the coals. Place the pork skin side up in the center of the hot grate over the drip pan and away from the heat and cover grill. Add 12 fresh coals every hour and 1/2 of wood chips to each side. Cook until darkly browned on the outside and very tender inside, about 4-6 hours. The internal temperature should reach 195 degrees. Pull off grill and cover with foil. Let rest for at least 20 minutes. Pull pork into large pieces, discarding any bones or lumps of fat. 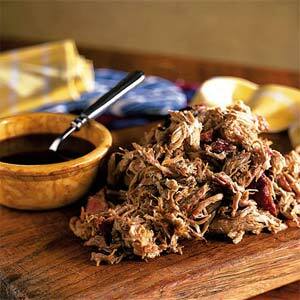 Transfer pork the pulled pork to a large aluminum foil pan and stir in 1 to 1.5 cups of vinegar sauce. Eating pig is messy. If you’re not covered with sauce when you’re done, you’re not doing it right.